The Entune multimedia system is a smart in-car tech feature that helps drivers stay connected wherever they go. You can get this system in most Toyota vehicles available at Bill Kidd's Toyota. The most notable part of the Entune system is the touch screen display. It acts as the central entertainment hub for your vehicle. You can change music stations, connect to satellite services, and so much more, all with the touch of your finger. Screen sizes vary based on the vehicle, trim level, and entertainment package you get. You buy a hybrid for its eco-friendly design, but that doesn't mean you can't want more from the vehicle. 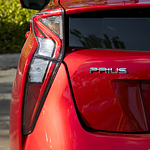 One reason Toyota Prius remains a popular compact is its ability to combine hybrid efficiency with other design elements, such as exterior features. Let Prius show you the way with headlights containing Bi-LED elements, which means a brighter pathway when it's dim or dark outside. Add the available accent lights for a more dramatic look, or get the integrated fog lights for better visibility during foggy drives. 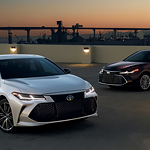 The Toyota Avalon is a favorite full-sized sedan that offers excellent values, economy, and flexibility. The Avalon Touring Exterior has a boldly shaped grill with a dark colored face. The package includes dark wheel accents and dual exhausts. The advanced styling gives the Avalon a bold and sporty stance. Cockeysville drivers will appreciate the Avalon Signature Lighting; the Avalon has a dynamic turn signal. The long inner light works with a shorter outer light to give a dynamic signal that will catch the attention of nearby drivers. The last thing you want to worry about when you’re on your way to work, school or a recreational engagement is whether your car will make it safely there. To put your mind at ease, take advantage of the Toyota Pre-Owned Certified program. This program pre-screens every used car so that you know you’re getting a reliable, safe and high-quality vehicle. Toyota's factory-trained technicians inspect and recondition each and every vehicle to its high standards. Drivers love the all new Corolla Hatchback series making its return in 2019. 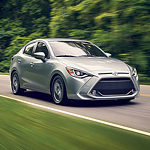 While the Corolla has always been a top contender in the compact car market, it’s been ranked highly this year for its superior safety and handling. 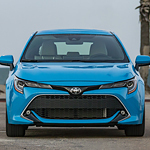 In addition, those who prioritize reliability will be happy to know that the Corolla scored extremely high, making it one of the safest and most reliable cars in the compact class. The entire crew at Bill Kidd's Toyota are excited to pass along a few of the reasons the Toyota C-HR is growing in popularity. Here's some safety features packed in this subcompact SUV you'll appreciate. The Toyota C-HR is making highway driving that much safer thanks in part to the Blind Spot Information System. Little lights on your side mirrors begin to flash when another vehicle moves into the blind spot on that side of your car, giving you a visual warning to steer clear and stay in your lane until the light stops flashing. The new Toyota Yaris is sure to turn a few heads as you drive down the road. With a new sportier look and honeycomb grille, make this small car functional and luxurious. The new fog lights add a bit of style to the front of the car and increase your visibility when weather conditions become hazy. The sporty style features continue through the rest of the car. The chrome finished exhaust pipe in the back adds a bit of flare to the car and the lip spoiler proves that the car is just as sporty as it looks. One of the main interior features in the Toyota RAV4 are the seats. There are six seats in total, and all of them are heated, and they all recline, too. In addition to having a heating seat, the driver will be using a leather steering wheel for total control, and the dashboard displays everything from gas to engine and computer specifications. This vehicle also includes a compass, so the driver will always know where he/she is going. The rearview mirror is dim during the day, and it lights up at night, which gives drivers even better rearview visibility. The crew at Bill Kidd's Toyota knows how important safety is when it comes to buying a vehicle. Here is what makes the Toyota Corolla such a popular compact car. Here is how the Adaptive Cruise Control feature works in the new Toyota Corolla. 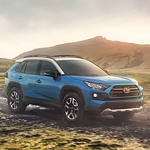 Activate the speed control like you would any cruise system, but then the forward-mounted sensors start to scan the road using radar technology to pinpoint a lead vehicle and create a driving buffer that will keep you from rear-ending another vehicle. 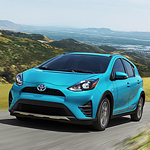 If protection in the worst-case scenario is a top priority for you when you're shopping for a new vehicle, take a look at the 2019 Toyota Prius C. This popular compact hybrid hatchback is equipped with a robust airbag system that's designed to keep you safe.